Hello gamebookers! Lloyd of Gamebooks turns 4 today (although I am writing this post on the 13th) and Fighting Fantasy turns 32! So it's time for another year in review! I'll go through what's been going on. Here are my most popular posts. They are mainly reviews or analysing some fundamental things to do with gamebooks (how to write them and how much game vs book should you use). There's also a couple of April A to Z posts there, which make sense as April is when a whole new audience comes to the blog. So I will plan to make more of my posts like this - I will revisit some gamebook writing posts with a fresh perspective, as I wrote some of them three years ago. I won't write too many reviews here as I write most of them for Fighting Fantazine. as for the April A to Z, I will try to do it next year, but now that I seem to have hit my ceiling with that, I am wondering if there is something else I could be doing that will get this blog to a bigger audience. If anyone has any ideas, I'd love to hear them. Here's my referring URLs. Not much to say about this. They haven't changed much over the years. One of the blogs on this list went on hiatus and most of these links refer back to old posts. So it seems that it takes a while for new links to take effect. Another theory I have for this is that a lot of gamebookers who have been blogging over the last couple of years, have also slowed down on the blogging because they have actual gamebooks or novels to write. I know this is the case with Ashton Saylor (who has several projects), Dave Morris (who is re-releasing a lot of books), Justin Parallax (whose book is now out), Scott Malthouse (who is working on USR). I guess once the projects come rolling in, there's less time for the blog. There are new blogs that have jumped up, though so there are plenty of individuals out there who want to talk about gamebooks. I just haven't been able to talk to them much recently. Basically, things are getting busy (see personal stuff), which Is why I had to reduce my posts to 1 a month rather than 1 a week. I feel that I need to keep them regular and not so frequent that I run out of posts, so I've always maintained a policy of writing more posts than I release. I decided to go down to 1 post a month when I started eating into my post stockpile. Although I haven't got to the end of it yet (I still haven't released some posts I wrote back in 2011), if I had carried on with 1 post a week, I would have dried up withing 6 months. I would rather keep regular posts then frequent posts followed by dry spells where no one knows if and when they will end. One solution to this problem was to invite people who have written gamebook blog posts, but do so infrequently now because they are busy, so that instead of several blogs with infrequent posts, we have one blog with frequent posts. To reflect this, I will change the name of the blog at some point (but I will keep the www.lloydofgamebooks.com url so that people can still get to the site there). More busy times. Moving house was one busy time, but that's done now. I have a toddler now, who keeps me busy. And things might get more busy in the future from this aspect. This year, I have mainly learned about all the things that most people consider to be the tedious part of writing, such as editing, proofing and being generally uncreative. Since my projects are going to be turned into apps, I have also had to learn to communicate with the app developer and discuss how to make the gamebook aspect work on screen. What constraints the app may have (memory size, screen size, limitations of code) and how to still write a gamebook that fits all of those constraints (restrictions breed creativity!). I have also talked to artists about how their work fits in with my gamebook and how my gamebook fits in with their work. I have had to think about intellectual property. I have had to think about each stat and number in the gamebook and decide whether it is appropriate, both in game terms and flavour terms (so how many gold pieces would this creature be carrying? What weapons and armour would this creature have? What kind of encounters would you find in a sewer? etc.). I was not expecting some of these tasks, I was not naturally inclined to all of them and there were some that, in other circumstances, I would never do. However, since it was in the name of gamebooks, I gritted my teeth, ploughed through them, and learnt that I could get some joy from some tasks, or at least see the reason for them. Right now, I am just anxious to see one of my big creations released, but there is going to be more to do before that - other people will read them, proof them, playtest them and then code them. So writing is never the only thing you have to do when writing. At the time of writing this post, I haven't even finished my Windhammer entry yet, so I don't know if that will be complete this year (shock horror!). I hope it is. If you haven't already, you still have time to enter the Windhammer competition! Closing date is 7th September. Tickets for Fighting Fantasy Fest are still on sale! The closing date for buying tickets is August 31st and the fest takes place on September 7th. For a while now, I have had a feeling that the blog is stalling. Partly because I have less time and want to devote more of it to writing actual gamebooks but partly for reasons I don't understand. Have I covered everything? Do I need a new layout? Do I need to focus more on my content? It is for this reason that I am trying to make changes and seeing what sticks. Also, I know lots of people like gamebooks, but I would love it if more people are vocal about them on the internet, or in real life (maybe I'm just going to the wrong places. Maybe there are four bookgroups within a mile of me that discuss nothing but gamebooks), how to write a gamebook (and by extension, what is optional and what is not optional when writing a gamebook), gamebook creation software, some short original gamebooks, more videos and looking at specific examples of things in gamebooks to see what we can learn from them. That's a long list and writing it got me excited. I am looking forward to it now. In conclusion, I have less time to dedicate to this blog, but it can still keep going. Gamebooks in the blogosphere have come a long way since 2008, when I could find only one blog dedicated to gamebooks. 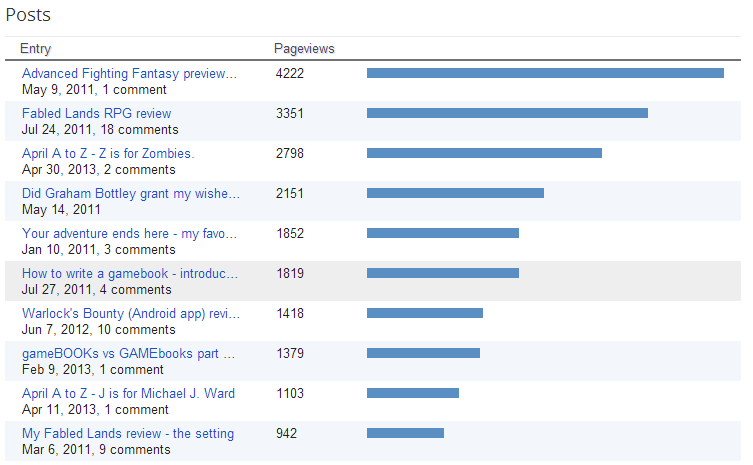 We could have a really good online community of gamebook lovers, which would lead to greater things. I think we're on the cusp of that (unless of course, there's a massive hub out there already and I'm just oblivious). So if you want to contribute to this blog, give me an email on sl1605@gmail.com. I also think it's the time that more of us can become gamebook writers. I've had people ask me to write gamebooks for their apps or give me ideas for them, or to critique their gamebooks, probably because they read this blog. However, with my real life stuff, I can't accommodate them all and i might not be the person to realise their vision. However, with programs like GBAT and a community of gamebook lovers, it's now as easy as ever to write your own gamebook and avoid the pitfalls that ruin a gamebook for people. So my advice is, if you have been thinking of doing something gamebook related for a while, it's time to put it into action and then see where it leads you. After all, that's all I did four years ago today. You're right about releasing books getting in the way of blogging, Stuart! It seems like I've spent most of the summer editing and typesetting Blood Sword. I spent my holidays in Krarth, lol. I'm planning to get back to more regular blog posts soon - even though it's great to get these old books back out there (and Blood Sword has been incredibly well received) I find the sense of dialogue and community you get from a blog is much more fulfilling. Looking forward to your blog posts. I also love the dialogue and community you get from posting them. It helps nurture my ideas and allows me to work out what people actually want without investing tons of time and energy into it. Thanks. I kept holding off from re-releasing those books because I was thinking of all kinds of ways to streamline the system - but really I just needed to get them out as they were. That's the trouble with something you know so well, there's an urge to tinker even if nobody is actually demanding any changes. The funny thing is, I know that mindset only too well from videogame development so I ought to have recognized the symptoms. After 18 months or more the designer and team start to get bored with what they've made and little changes creep in that are completely unnecessary. Anyway, it's nice to have Blood Sword out there again and finding a whole new audience as well as the original players.